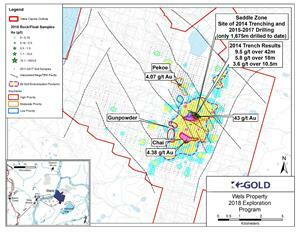 VANCOUVER, British Columbia, Nov. 06, 2018 (GLOBE NEWSWIRE) -- K2 Gold Corporation (“K2” or the “Company”) (KTO:TSX-V) is pleased to report the completion of 2018 exploration at the Wels Gold Property (“Wels” or “the Property”) located in west-central Yukon Territory in the Traditional Territory of White River First Nation (“WFRN”). New regional structures were identified at the Wels property with the help of ground magnetics, VLF, and Lidar data collected earlier in the summer. Ground truthing and prospecting of the new structures, together with coincident soil anomalies, returned gold (4.07 g/t Au) in altered rock quartz-carbonate gabbroic subcrop at the previously unexplored Pekoe soil target. Pekoe is located 1.6 km north west of the Saddle zone where previous drilling and exploration has been concentrated. Prospecting at the Saddle zone region located further gold bearing quartz vein float (43 g/t Au) 25m north and upslope from the main known Saddle zone, perhaps representing a new parallel mineralized zone. In addition, limited prospecting at the Chai target 1.2km south of Saddle located further gold in quartzite float (4.38 g/t). As a result of the exploration undertaken in 2018, the footprint of gold mineralization at Wels (combined soils, rock and float samples) has now been extended to the north and is currently approximately 4km N-S by 2km W-E. Limited drilling at Saddle (1,642m over 2 campaigns 2015/2017) has identified a 10-30m wide gold zone, which is open in all directions. Apart from the Saddle target none of the other targets at the Wels Property including Gunpowder, Chai, or Pekoe have ever been trenched or drilled but are scheduled for further investigation in 2019. The Wels mineralization has geological analogies to an orogenic style deposit. The most well known of this type locally is Goldcorp’s Coffee deposit located 60km NE of Wels (2.16M ounces proven and probable reserves and 2.93M ounces of combined measured, indicated and inferred resources, as reported by Goldcorp’s 2018 investor presentation). For reference the footprint of the main mineralized zone at Coffee (the Supremo to Double-Double area) is 5km x 3km. Geophysics and Lidar conducted in the early summer at Wels has helped to refine the existing magnetic airborne data signal significantly for broad anomalies and develop finer nuances over some of the interpreted structures. In addition, there is a relatively strong agreement between the low to moderate strength magnetics and the distribution of anomalous gold in soils. The 2018 exploration results enable the development of numerous, untested structural targets that are well supported by coincident geochemical and geophysical evidence. It is anticipated that these new targets will be tested with prospecting, trenching and/or drilling in the 2019 field season. Jo Price, P.Geo., VP Exploration of K2 and a Qualified Person under National Instrument 43-101 has reviewed and approved the technical information on this release. For additional information please contact Stephen Swatton at 604-331-5093. This news release contains forward-looking statements that are not historical facts. Forward-looking statements involve risks, uncertainties and other factors that could cause actual results, performance, prospects and opportunities to differ materially from those expressed or implied by such forward-looking statements, including statements regarding the 2017 exploration program at the Wels Gold, Storck, Ladue and Flume Properties (collectively the “Properties”), including results of drilling, and future exploration plans at the Properties. Factors that could cause actual results to differ materially from these forward-looking statements include, but are not limited to, variations in the nature, quality and quantity of any mineral deposits that may be located, the Company’s inability to reach satisfactory agreements with First Nations to facilitate its exploration and development plans for the Wels Property, the Company's inability to obtain any necessary permits, consents or authorizations required for its planned activities, and the Company's inability to raise the necessary capital or to be fully able to implement its business strategies. The reader is referred to the Company's public disclosure record which is available on SEDAR (www.sedar.com). Although the Company believes that the assumptions and factors used in preparing the forward-looking statements are reasonable, undue reliance should not be placed on these statements, which only apply as of the date of this news release, and no assurance can be given that such events will occur in the disclosed time frames or at all. Except as required by securities laws and the policies of the TSX Venture Exchange, the Company disclaims any intention or obligation to update or revise any forward-looking statement, whether as a result of new information, future events or otherwise.